I was kindly given a copy of Bill Drummond’s latest book 100 for my birthday. Within it he responds to a question regarding ‘the end of the process of art’. He is asked if he considers any of his work complete and counters with the somewhat futile example of the project Smell Of Money Underground. Drummond is acutely conscious of the ponderous haphazard nature of his efforts and says ‘I am aware that once an idea starts to push itself into my consciousness and then starts to clamber for attention and finally demands that I turn it into a reality, I end up paying some sort of emotional if not physical price’. His creative adventures hence are concepts typically thought through to a logical if somewhat terminal conclusion, whether that is a ridiculous number one hit single or choosing a song to be played at his funeral. I have displayed upon my lounge wall small fragments of this particular strange project that I purchased from Penkiln Burn. Five landscape format cards, each signed and having a tiny mounted foam backed square are all presented within an A2 glass frame. The squares have been carefully sliced from the Richard Long print Smell Of Sulphur In The Wind. Drummond, outspokenly fond of Long’s work, famously purchased the print for $20000 and then frustrated with the general state of English art and beholden to a print which could not compete with his rural Wiltshire view sliced it into 20000 equal pieces in order to sell them on. 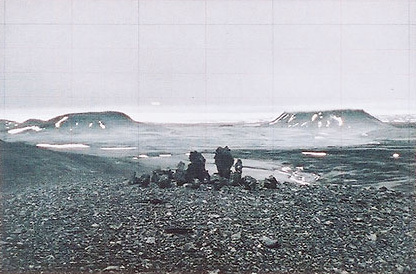 The eventual aim of the endeavour is to take the $20000 sum total and bury it in the centre of the circle depicted in the photograph. The structure is located in Iceland’s wild tectonic landscape, thus turning the creative process full circle and embracing the damp stony shards of its geographical origins. Drummond describes his admiration for Long in his semi-autobiographical book 45. He writes of the opportune connection with Long’s walking art having discovered him on one of his own quests in London as he followed the path of his capitalised name roughly inked onto a scruffy A to Z. Stumbling around a corner Drummond chanced upon a private gallery selling Long’s map works. Spying the work for the first time he mused that the art ‘obviously described a walk in a most minimal of zen like way’ and this immediately resonated deeply with his Ordinance Survey loving family’s treks over bleak landscapes as a disgruntled youth. Long’s Heaven and Earth exhibition in 2009 at Tate Britain was a triumph of energy and helped document a vast body of work in a lofty formal context. I found the map sketches particularly thought provoking and a welcome glimpse into the private thoughts of a solitary rambler. Nicholas Serota, director of the Tate, wrote in the exhibition notes about one of Long’s first strikingly pure works ‘In A Line Made by Walking (1967), a work made at the age of 22, Long changed our notion of sculpture and gave new meaning to an activity as old as man himself. Nothing in the history of art quite prepared us for the originality of his action.’ The guide also contained a sequence of Long’s quotes which forms a beautifully eloquent observation of our physical connection with making and wandering. The simple text and card shapes upon my wall then ultimately represent an elegant connection between two artists I admire, in a brilliant accidental manner. I will probably never be able to afford a complete Long work, though I can reflect upon the chance connections and fortuitous intermeshing of two outsiders as I walk along my own muddy trails across this country. This is the mysterious territory of Rebecca Solnit’s heroic lone walker who is ‘both present and detached, more than an audience but less than a participant’. One can revel in the subtle echoes between geography and thinkers effortlessly curating together the drifters, the makers and the arcane map junkies. Long has a new exhibition at the Hepworth in Wakefield which I might get to – I did see the Tate one which was a good overview, if rather chilly! I like the movement and stillness quote – we always think of the movement rather than the stillness of walking. Drummond is someone I have come across in various contexts but never read – interesting to pursue. Good point, pausing in the walk is equally important. Drummond is an eccentric worth pursuing simply because of his intriguing creative adventures which like J Deller work with other people. He too appears to exist in that world outside popular culture even though he made his money revelling in it as part of the KLF! Great post Matt. Feel as if I could almost have written it myself. I also have a piece of Smell of Sulphur in the Wind (just the one though!) and have ‘100’ stacked up in the holding bay waiting to read! I love Drummond’s books/practices. They resonate on so many levels. Have you read $20,000 which is an extended account of the SoSITW escapade? Also managed to get to Wakefield last week whilst on holiday so caught the Richard Long exhibition there and picked up a collection of his ‘Selected Statements and Interviews’. Has also reminded me that Drummond did a long show on Resonance last week which I missed so hopefully will find it online somewhere. Best. Thanks, very kind. I haven’t read the $20K book and sadly won’t be able to get up to Wakefield either, though I’d love to see the Hepworth gallery too. Hilariously my five segments are all of the frame, others fared better than me! What I love about Drummond is his matter of fact ernest thoughts, reading his books are akin to having a chat with an old friend in a pub. Long too is both clever and yet brilliantly simple and pure, it’s hard not to think of certain Zen practices of no mind. I’ll hunt for the Resonance show too. Mine is of the frame as well! In the $20,000 book he tells the story of when he first takes the ‘pitch’ on the road and not surprisingly everyone wants a piece of the centre. He soon figures that this isn’t going to work as all he would have to display at future gigs would be the white frame. So he devises a co-ordinate system to allocate each piece. There is also a very funny incident involving Richard Long himself but won’t spoil it in case you read it. Very impressed with the Hepworth gallery. A great space and with Long and Luke Fowler complimenting the core Hepworth collection it was a great day. Heh,we all have the pesky frame… I’ll hunt the book down, I do wonder how many slices are left for people like us to consume? As for the Hepworth praise indeed, it’s definitely on my list of places to visit next time i’m in Yorkshire. Hmmm. Mine’s of the frame too. Scam I reckon. I think the odd thing about the Smell of Money… is that though it has a fully thought through plan, it seems unlikely that there will ever be 20,000 buyers, meaning that the piece can’t really be completed as envisaged. Not sure whether he thought about that in advance or not. I liked the idea of a bunch of treasure hunters with shovels and copies of a Richard Long coffee table book. Though it makes sense in this instance, I’d say a lot of Bill’s ideas aren’t really thought through to a conclusion as such (e.g. the 17 / cake circles / soup lines), but that they start as ideas and he’s not sure where they’ll go. I’ve enjoyed both Richard Long exhibitions I’ve been too, though they were basically identical. I find the odd thing is that much of the photography makes very nice landscape photography, but I’m never sure it’s really the art work – that’s the actual walk which seems to impossible to satisfactorily document (to split an infinitive). Maybe we have all been conned? I also like the idea of keen treasure hunters too. I suspect Drummond is often well meaning, but perhaps a little baffled when projects take upon a life of their own. As for documenting the walks, the words and maps are enough for me, a hint of the journey ahead, a scribbled map or moment of silence. I guess in many ways he hopes to inspire our travels, of the moment of expectation? Perhaps there it’s closest to the Zen of Alan Watts or the drifting of Debord?